Quartz is a chemical compound consisting of one part silicon and two parts oxygen. It is silicon dioxide (SiO2). It is the most abundant mineral found at Earth’s surface, and its unique properties make it one of the most useful natural substances. Quartz is the most abundant and widely distributed mineral found at Earth’s surface. It is present and plentiful in all parts of the world. It forms at all temperatures. It is abundant in igneous, metamorphic, and sedimentary rocks. It is highly resistant to both mechanical and chemical weathering. This durability makes it the dominant mineral of mountaintops and the primary constituent of beach, river, and desert sand. Quartz is ubiquitous, plentiful and durable. Minable deposits are found throughout the world. Color Quartz occurs in virtually every color. Common colors are clear, white, gray, purple, yellow, brown, black, pink, green, red. Quartz is one of the most useful natural materials. Its usefulness can be linked to its physical and chemical properties. It has a hardness of seven on the Mohs Scale which makes it very durable. It is chemically inert in contact with most substances. It has electrical properties and heat resistance that make it valuable in electronic products. Its luster, color, and diaphaneity make it useful as a gemstone and also in the making of glass. Geological processes have occasionally deposited sands that are composed of almost 100% quartz grains. These deposits have been identified and produced as sources of high purity silica sand. These sands are used in the glassmaking industry. Quartz sand is used in the production of container glass, flat plate glass, specialty glass, and fiberglass. Quartz is very resistant to both chemicals and heat. It is therefore often used as a foundry sand. With a melting temperature higher than most metals, it can be used for the molds and cores of common foundry work. Refractory bricks are often made of quartz sand because of its high heat resistance. Quartz sand is also used as a flux in the smelting of metals. Quartz sand has a high resistance to being crushed. In the petroleum industry, sand slurries are forced down oil and gas wells under very high pressures in a process known as hydraulic fracturing. This high pressure fractures the reservoir rocks, and the sandy slurry injects into the fractures. The durable sand grains hold the fractures open after the pressure is released. These open fractures facilitate the flow of natural gas into the well bore. Quartz sand is used as a filler in the manufacture of rubber, paint, and putty. Screened and washed, carefully sized quartz grains are used as filter media and roofing granules. Quartz sands are used for traction in the railroad and mining industries. These sands are also used in recreation on golf courses, volleyball courts, baseball fields, children’s sand boxes and beaches. One of the most amazing properties of quartz is the ability of its crystals to vibrate at a precise frequencies. These frequencies are so precise that quartz crystals can be used to make extremely accurate time-keeping instruments and equipment that can transmit radio and television signals with precise and stable frequencies. The tiny devices used for these purposes are known as “crystal oscillators.” The first crystal oscillators were developed in the 1920s, and just twenty years later, tens of millions of them were needed each year to supply the military during World War II. Today, billions of quartz crystals are used to make oscillators for watches, clocks, radios, televisions, electronic games, computers, cell phones, electronic meters, and GPS equipment. A wide variety of uses have also been developed for optical-grade quartz crystals. They are used to make specialized lenses, windows and filters used in lasers, microscopes, telescopes, electronic sensors, and scientific instruments. The material of beach sand is now the material of the world’s most advanced electronic devices. During the 1900s the demand for high-quality quartz crystals accelerated so rapidly that mining operations around the world were unable to supply them in adequate quantities. Fortunately, this need was realized during World War II, and military and private industry began working on methods to grow synthetic quartz crystals to meet the special requirements of optical and electronics use. Today, most of the quartz crystals used in electronic components and optical instruments are grown in laboratories instead of produced from mines. Most of the laboratories grow their crystals using methods based upon the geological process of hydrothermal activity. The synthetic crystals are grown at high temperatures from superheated waters that are rich in dissolved silica. These manufactured crystals can be grown in shapes, sizes and colors that match the needs of manufacturing processes. The cost of growing synthetic quartz crystals is competitive with mining, and the only limit on production is the availability of crystal growth equipment. Quartz makes an excellent gemstone. It is hard, durable, and usually accepts a brilliant polish. 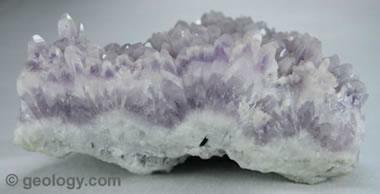 Popular varieties of quartz that are widely used as gems include: amethyst, citrine, rose quartz, and aventurine. Agate and jasper are also varieties of quartz with a microcrystalline structure. Tripoli is crystalline silica of an extremely fine grain size (less than ten micrometers). Commercial tripoli is a nearly pure silica material that is used for a variety of mild abrasive purposes which include: soaps, toothpastes, metal-polishing compounds, jewelry-polishing compounds, and buffing compounds. It can be used as a polish when making tumbled stones in a rock tumbler. Tripoli is also used in brake friction products, fillers in enamel, caulking compounds, plastic, paint, rubber, and refractories.